Enhancing your published posts by adding important Structured Data, your posts are understood better by search engines. Also, potential visitors then know more about your pages before visiting them. When correctly set up, this will increase visitor engagement. 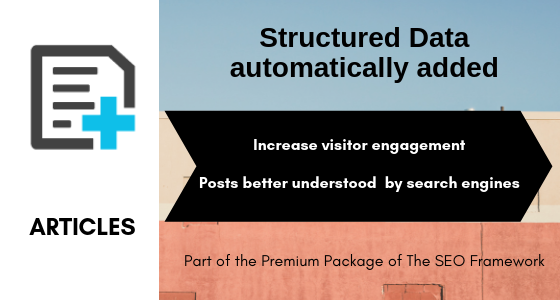 Structured Data helps search engines understand how your website and its content are set up. It tells search engines what the current page and the website are about. So, search engines (Google in particular) use this information to annotate your page’s information within their search results – for the Search Engine Results Page (SERP). ensures that News Articles are prominently displayed in Google’s search carousel. improves search presence for Blog Posts. All this makes the Articles extension a must-have add-on for bloggers and text writers. Note: Articles is part of the Premium Package of The SEO Framework.